I frequently receive emails regarding how to plan an itinerary in Paris. It’s true that there are endless things to see and do which makes it pretty difficult to decide what’s worthy of your precious and often limited time in the city. For me the perfect day in Paris combines the ideal mix of walking, cafe-hopping, sight-seeing, absorbing art and cocktail-sipping. I thought I’d share what a perfect day in the city of light looks like to me in the hope that it might help you to plan your own. Wake up at the crack of dawn to catch the sunrise. The rewards of watching the sunrise in Paris are always enticement enough to get me out of bed. 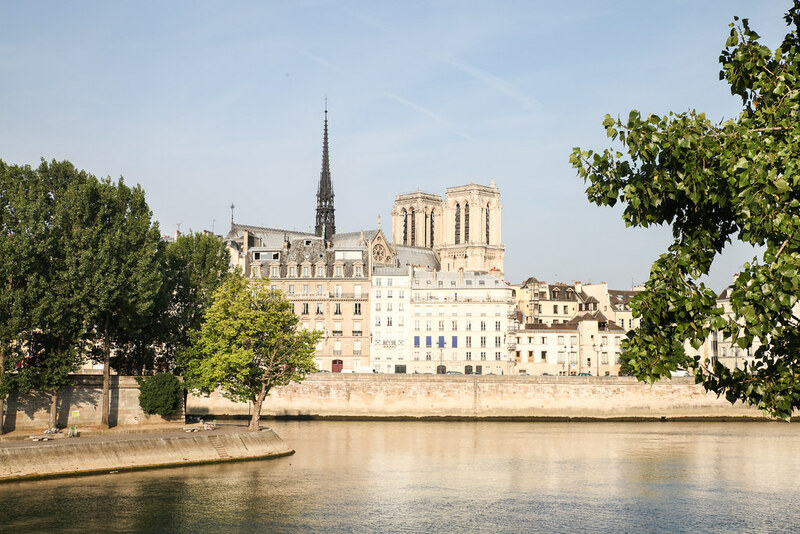 Ile Saint Louis is a pretty special spot as the rays flicker over the river Seine and the dappled morning light dances off the buildings. 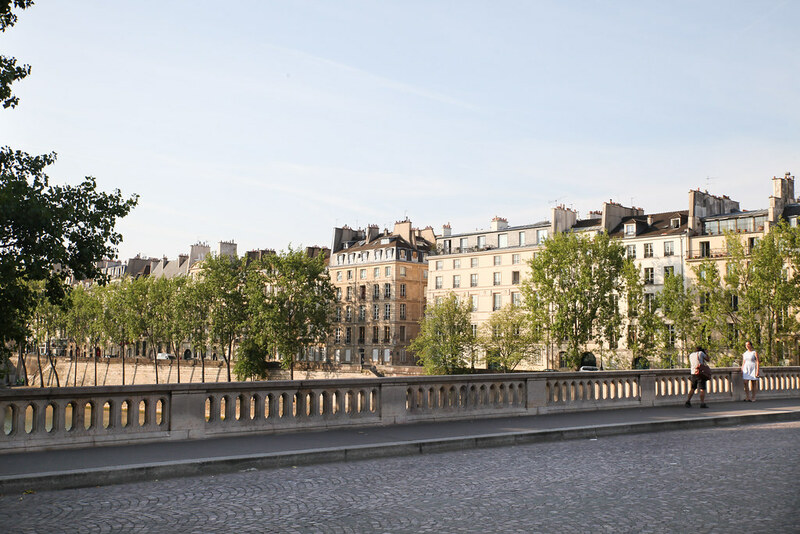 After walking around the quiet streets of this beautiful island, cross the Louis Philippe bridge back to mainland Paris. The Marais is one of the oldest areas of Paris. The cobbled backstreets are a beautiful place for meandering and are bursting with boutiques, vintage shops and eateries. 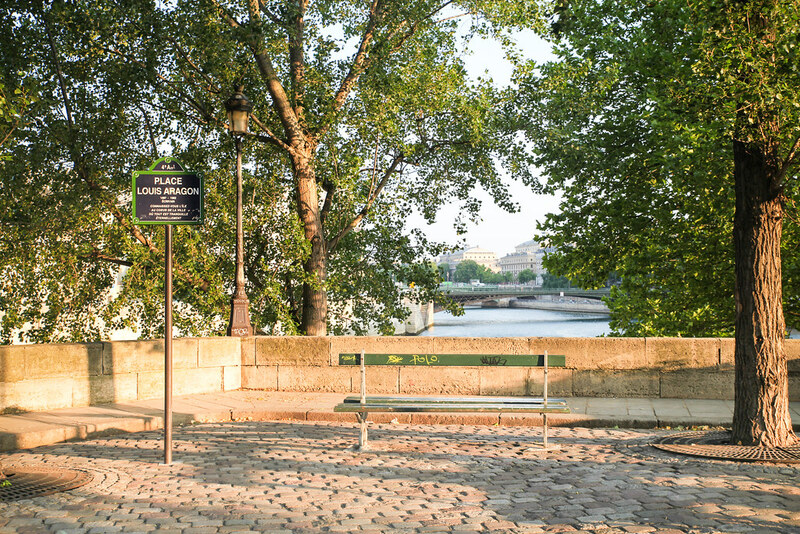 It’s a short walk from Ile Saint Louis and a very pretty one too. 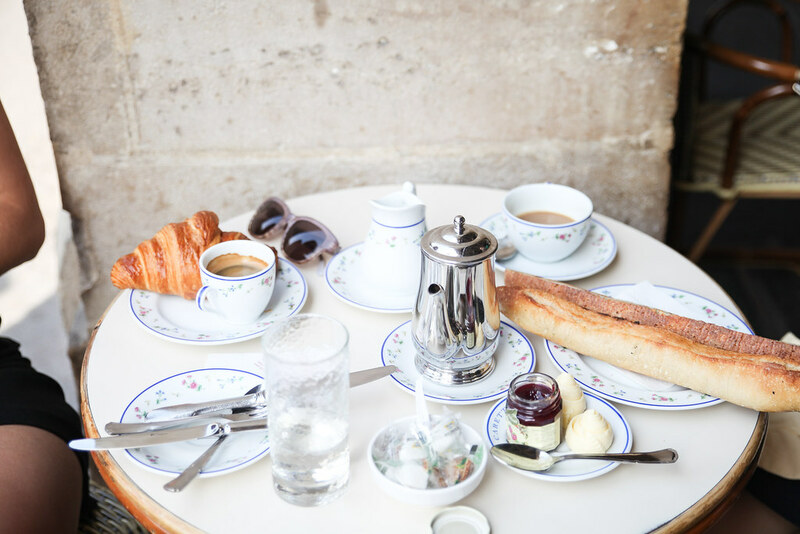 I’m sure you’ll have worked up quite an appetite after that early start and all of that walking so Cafe Carette is a great spot to fill up on a traditional French breakfast. I would recommend the tartine which is not only enormous but also comes with the cutest pots of jam and curled butter. 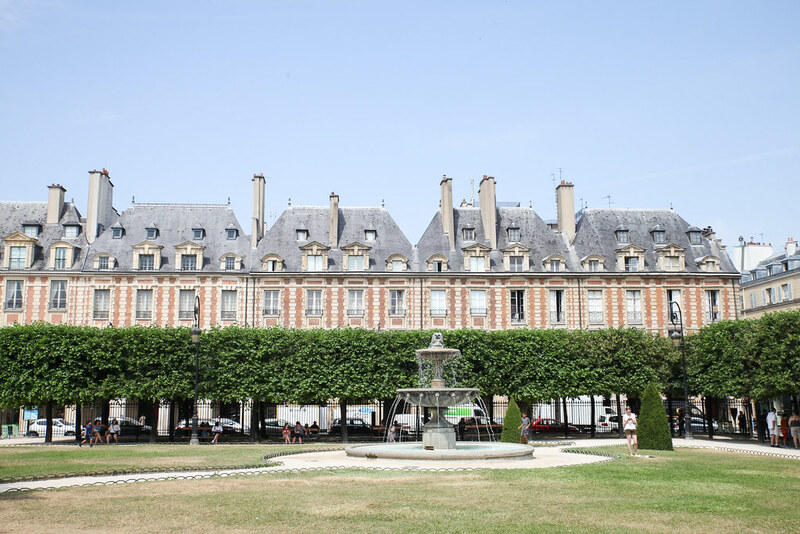 Carette is located under one of the archways which frame Place des Vosges so it’s just a hop, skip and jump away from this park. The red-brick buildings which overlook the oldest planned square in Paris have become emblematic of the Marais. A bit of culture is always a fun way to break the day and there is nowhere better to do this than the recently opened Picasso museum. 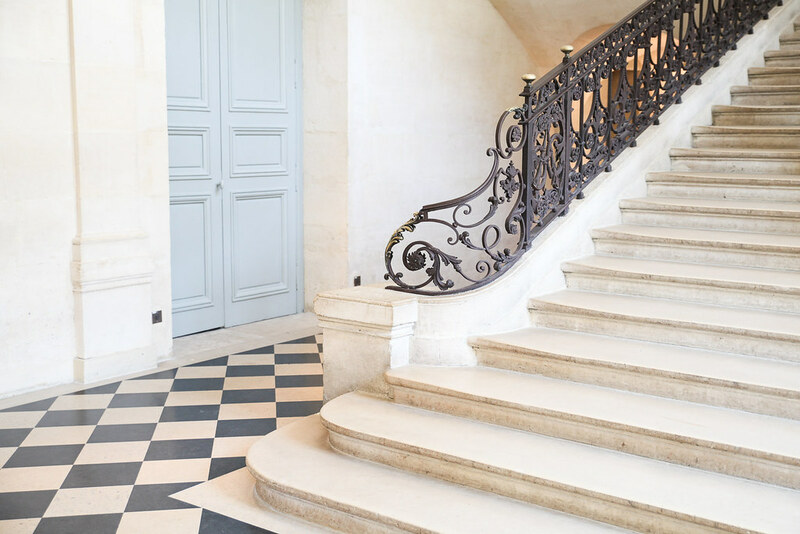 The building itself is worth a visit with its white-washed interior and breathtaking staircase but it also houses a large collection of Picasso’s and other modern artist’s work. 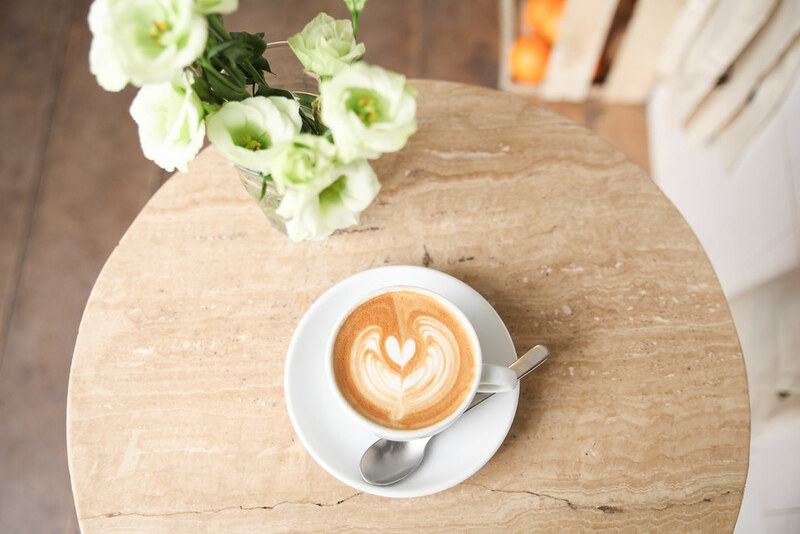 It’s time for a well-earned coffee break if you ask me and Boot cafe is just the place to stop for a flawless flat white. This speciality coffee shop was once a shoe-repair store and despite its tiny size has more character than most. Now it’s time to jump on the métro for the first time in the day and head to a different part of town; head to the station St-Sébastien Froissart jump on line 8, change at Bastille to line 1 and descend at Palais Royal-Musée du Louvre and you’ll arrive at your next destination below. 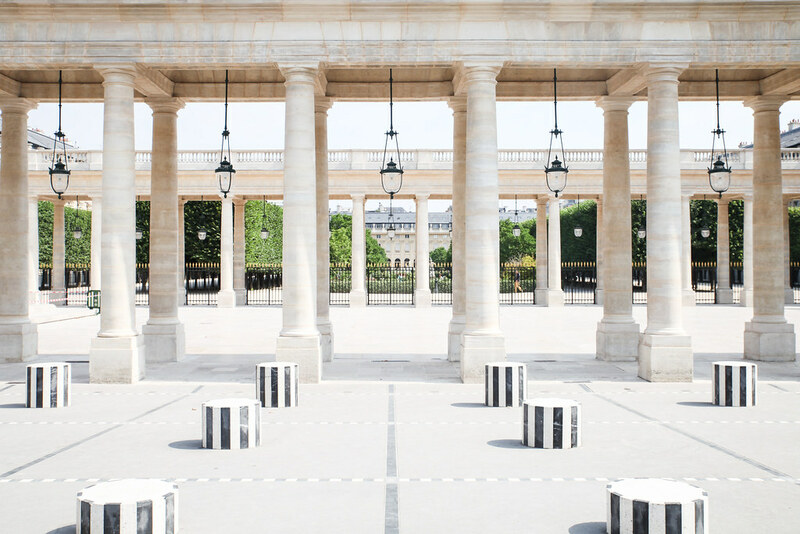 The recently refurbished Palais Royal is even more beautiful than it ever was, if that’s possible. A perfect day in Paris would always involve wandering around this charming garden. The peaceful nature of the gardens make it feel far removed from its actual location in the center of Paris. 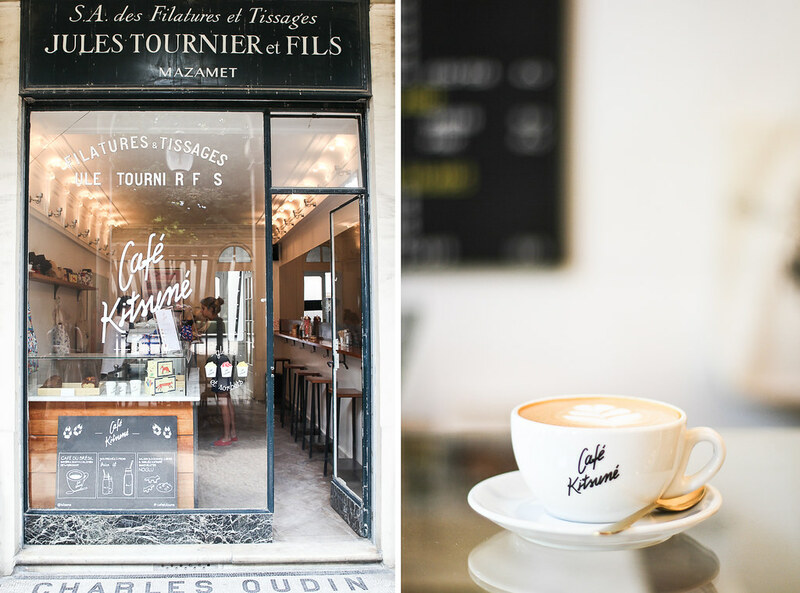 Coffee lover that I am, my mentality is that you can never drink too much coffee in a day not to mention it would be sinful to pass by Palais Royal and not visit Café Kitsuné. Grab a coffee to-go or a coffee affogato (espresso poured over ice cream) and enjoy it by the fountain in the gardens. This spot has become very fashionable of late and its marble tables and instagrammable dishes might have a thing or two to do with it. Not only for aesthetic reasons though, the menu here is a stellar one and the food is a sensory delight. 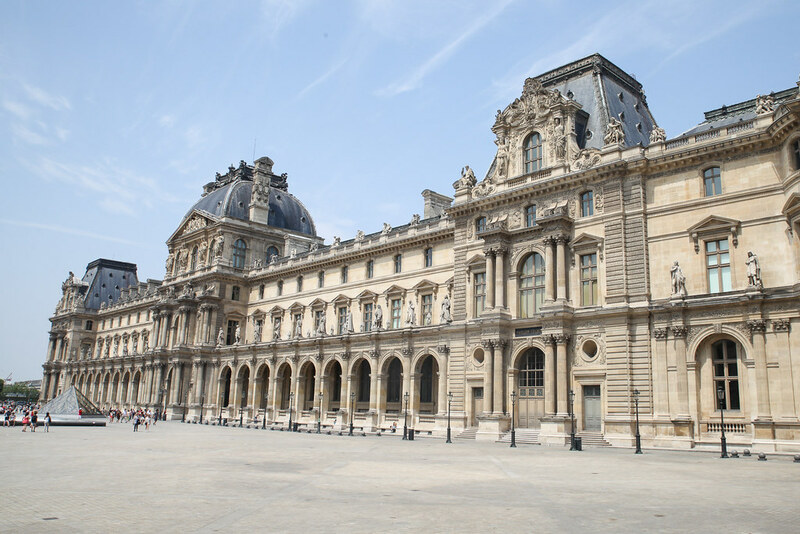 The Louvre is a very short walk so I would recommend passing by to marvel at this architectural gem. Come here to take a few fun shots in front of the pyramid and just generally goof around the courtyard. 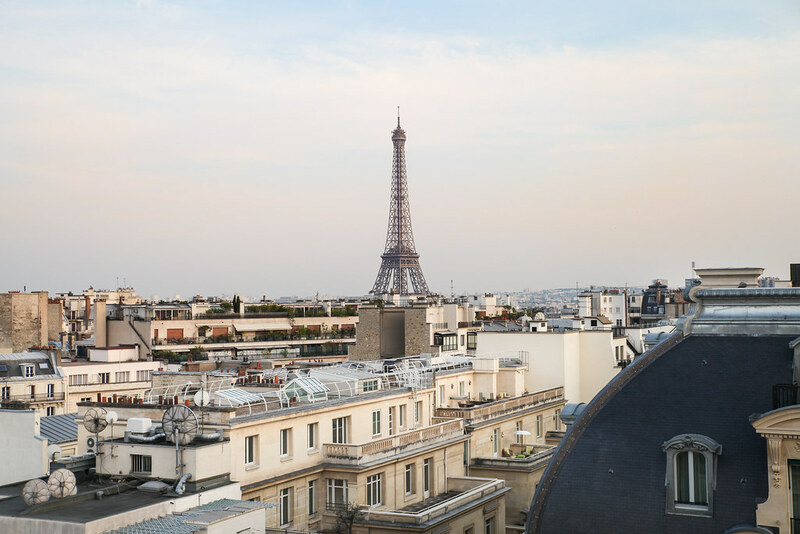 There’s nothing quite like seeing a city from above, so a perfect day in Paris always has to include a panorama. Riding on the ferris wheel is sure to put a smile on my face and make me feel like the luckiest person alive for having such an incredible day. 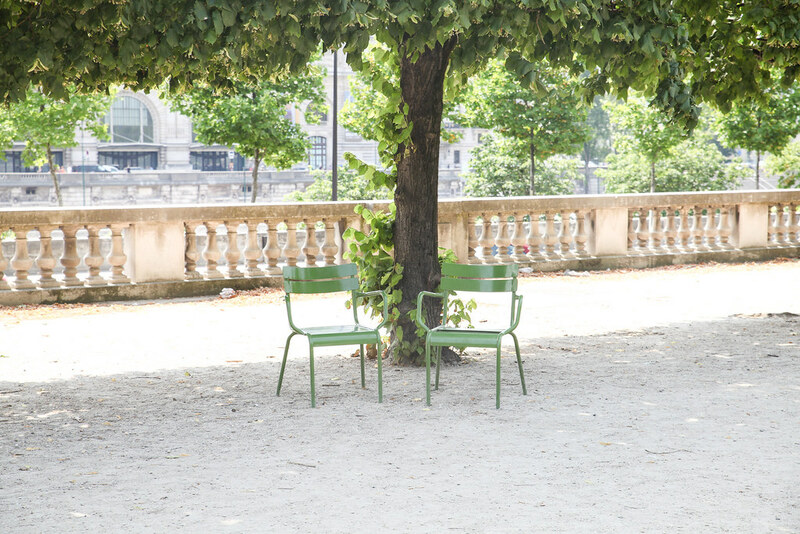 Rest those weary legs on one of the iconic green chairs in the beautiful Tuileries gardens. I always take a moment to take in all of the famous monuments which surround these gardens and pinch myself that I’m in Paris. End the most wonderful day with a cocktail or two at Hôtel Raphael and catch the last rays of sun softly flickering behind the Parisian rooftops. I can’t imagine a better way to draw the day to a close than watching the sunset and the Eiffel Tower sparkle in the distance with good friends and good cocktails. I hope you enjoyed reading this as much as I enjoyed writing it. 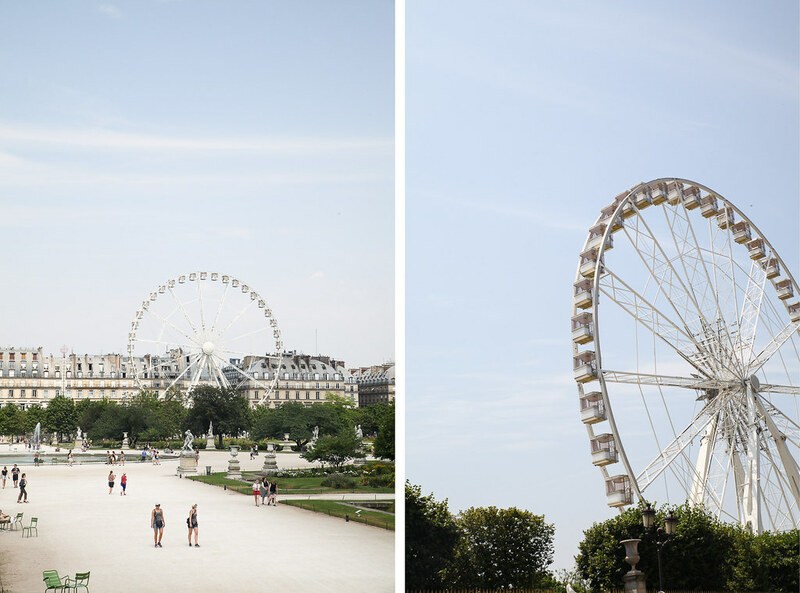 What would a perfect day in Paris look like to you? Incredible photographs! I’m heading to Paris in September. Cannot wait! Thank you – so soon I hope you have the best time! I adore Paris – it’s by far my favourite city in the world. What a perfect day you’ve planned – I’ve got to check out some of your restaurant/cafe recommendations when I’m next over. Ooh, I just adore this! I’m moving to Paris from SoCal for school next week, and will definitely be putting this guide to use the week before classes start. What fabulous suggestions! I love the mix of culture and gastronomy and leisure. Lovely spots to discover in my beloved Paris. Just came back from Ibiza but already planning my Paris vacay this Fall. 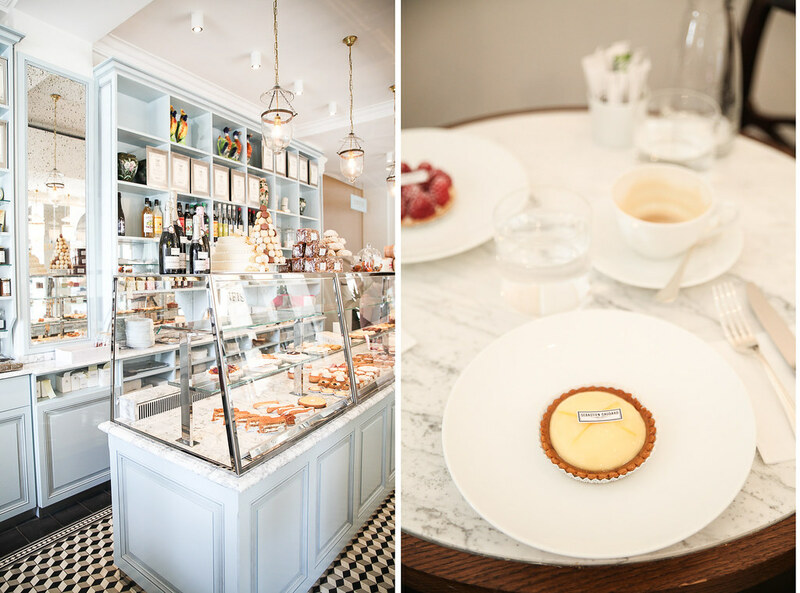 Café Kitsuné will be on my list, for sure ! Thanks of sharing these wonderful places ..
I’m going to Europe for the first time in a couple weeks and am heading to Paris (solo) for about a day and a half. I’m so excited, and this guide is just PERFECT – I might just follow it to a T. :) Thank you so much for sharing! !